Get the goss on what’s in for this spring/summer season, including new trends and popular looks that we’ll see stick around. The translucent trend is here to stay! In addition to the neutral tones we’ve seen over the last season, there’s a growing array of coloured translucents for a more bolder look. Designers are mixing materials and tinting translucent acetates to create a ‘frame within a frame’ look, in both subtle and striking styles. Sharper, bolder geometric silhouettes are coming into play including octagonal and hexagonal shapes. 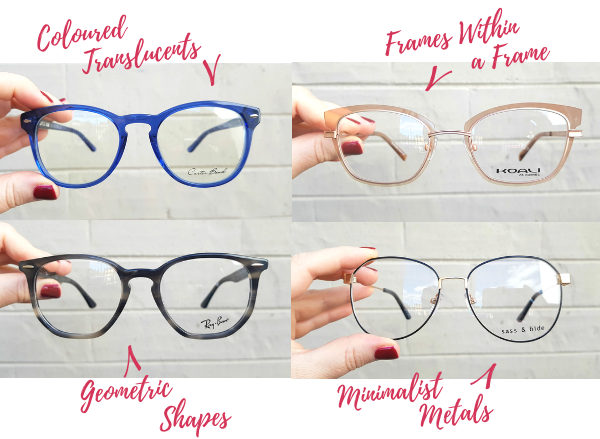 Think retro inspired, no-fuss metal frames. From the popular round shapes of the 90s to the double bridge aviators of the 70s. Optical Extras? Use them before they melt away away Dec 31st.